For this wedding cake I used a Honey Spice Cake Recipe. This is a satellite cake cnsisting of 4 different round cakes, mounted on a special cake base. Each cake was covered in white fondant which I prepared myself. The tiers are cut in half and put back together with Dulce de Leche. They are covered with dulce the leche so that the fondant sticks to the cake. 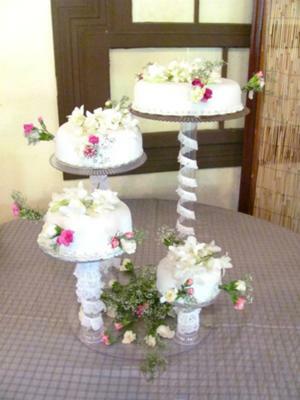 Flower arrangements are natural flowers following the flower decoration of the tables. This cake yields enough for 100 people. YOUR CAKE IS JUST BEAUTIFUL, WHAT A GREAT JOB, I AM SURE THEY LOVED IT. KEEP IT UP!!! !